Painted by a Chris Adcock. And I happen to be William (Bill, for preference) Adcock. The Perrys are based out of Nottingham, which is a 42 minute drive from Leicester, where my great-grandfather was born. It would not surprise me in the least if it turned out that this Chris Adcock and I are somewhat distant cousins. 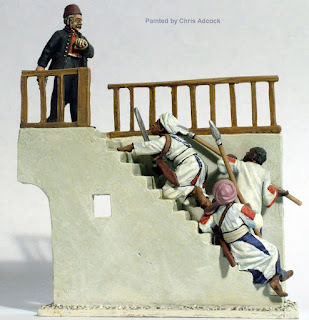 I joke that holding a university degree in History is the Adcock Curse (I have my degree in History, as does my father, as did his mother, who was one of seven women working towards a Masters Degree at Columbia University that year), but perhaps painting toy soldiers is as well. I paint them, my father built model kits and 1/32nd scale plastic figures until he was in his 40s, and apparently there are Adcocks back in the Motherland working with toy soldiers as well. Every time I read this it puts the biggest smile on my face. Thanks, Evan! There is allegedly a family castle somewhere - 50 years ago my father got to ride in a limo with it's owner when he crossed the pond to see Niagara Falls.